There are tons of website builders you can use to create your website, but I am going focus on using WordPress. I currently use WordPress, and I am super happy with it. My website is easy to customize, and I can even add and change content on the go with the WordPress app. Today, I’m going to tell you how to build a website on a budget, the differences between WordPress.com & WordPress.org, and my tips for creating a website you love. WordPress is a content management system (CMS), which means that it is a piece of software that houses and manages content for a website. WordPress comes in two forms: WordPress.com and WordPress.org. WordPress.com is a CMS and hosting plan all in one. It’s great for beginners, because Automattic (the owners of WordPress.com), takes care of any and all security and maintenance issues. All you have to focus on is creating content for your website. WordPress.org is the software known as WordPress. Sometimes referred to as “free” WordPress, you have to find your own hosting plan. I use SiteGround, and I am very happy with them. You do have to pay for your hosting plan, but many website hosts have an option for a one-click WordPress installation. 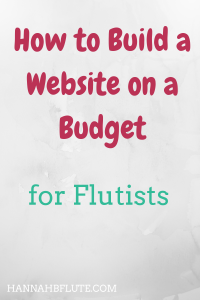 When you’re strapped for cash, it can be hard to spend money on your website. With all of the free options out there, it’s tempting to save your money for other things. Don’t do that. At least not for the long term. I had a blog and website for about two and a half years before spending money on it. And boy, I wish I invested money in my website sooner. You don’t have to spend hundreds of dollars, but there are a couple of things that you should have if you want to be taken seriously. In the beginning, I spent $12/year, then $60, and now I spend about $144/year on my website. First, you need a professional name. If you are building a website as a means of growing your career, your website needs a professional name. Nothing like flutelover99 or oboeliciousblog. Your website name could be your own name, or it could be your name followed by “music” or your instrument. As you can see, I named my website “Hannah B Flute.” It includes my first name, middle initial, and my main instrument. It’s short and sweet, and it explains the focus and purpose of this website. The second thing you should have is your own domain name. If you decide to buy your own website hosting, you will have to choose your own domain, and WordPress.com allows you to use a subdomain (example.wordpress.com). A subdomain is okay when starting out, but once you settle on a name, you really should get your own top level domain (example.com). A top level domain has two benefits that a subdomain does not. It is more professional, and it is easier for people to remember. Both of those things are important when building your professional image on and off the internet. At this point, I only pay for my website hosting and my domain names. I have hannahbflute.com (my current website name) and killerharmony.com (my website’s former name, which redirects to HBF). You can buy a domain name for around $12/year, and there are hosting platforms that offer packages for $5-10/month. There are tons of extras you can add, like premium themes (templates, basically) and premium plugins (which add features without requiring you to add code). But no, you don’t need to pay for much besides your domain and hosting. If you need or want help creating your website, there are services out there that can help. I specialize in creating blog content, and I can help you create the website/blog of your dreams. Don’t worry about perfection. You can always edit your website later. Just get it up and going. Edit your content. Be it a biography or a blog post, edit your content, preferably before you hit publish. Not an editor? I can help. Ask for help. It’s great if you can build your whole website yourself, but if you can’t, don’t be afraid to ask for help. Stick to your budget. If you are on a budget, stick to it. Don’t be tempted to spend money you don’t have. Have fun with it! Yes, your website should be professional, but you should enjoy creating it. It should be a reflection of you, so enjoy the process. Do you have a website? Do you wish you did? Leave your answers in the comments, or fill out this survey!